Call it a teachable moment—actions have consequences. After the University of Missouri at Columbia was thrust into the national spotlight by a series of protests by black students that were vigorously supported by a number of faculty members, new Mizzou enrollment figures have “decreased noticeably” from the previous year, according to Missouri TV station ABC 17. However, the report indicates that the biggest drop in new freshman enrollments is for black students, down a whopping 19 percent from the previous year. The University of Missouri made national headlines in November when a group of Black Lives Matter-inspired activists, calling themselves Concerned Student 1950, convinced black players on the college’s football team to go on strike to support the groups’ demands. That strike almost immediately caused the school’s president and chancellor to resign their positions. Breitbart News reported that the former UM law professor who was named interim president after the resignations had been assisting the students in their protest to topple his predecessor. More headlines were made at Mizzou when video went viral of a student at the school being threatened by a professor named Dr. Melissa Click for videotaping in a public area of the university that protesters had occupied as their own “safe space.” Click was seen on camera asking for “muscle” to help remove the student. 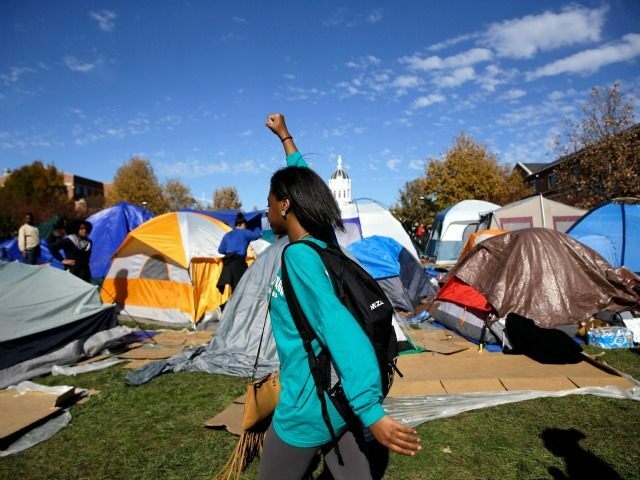 The University of Missouri protests inspired other campus uprisings across the country, from Connecticut’s Yale University to California’s Occidental College. The media coverage and momentum of these black student protests came to an abrupt end when terrorists killed nearly 150 people in Paris, France. At that point, the students and supporters of their actions complained about the press coverage that the Islamist terrorists were getting. Although the protesters were effective in getting many of their demands met, the University of Missouri protests also led to a powerful backlash, as conservative media like Breitbart News held a spotlight up to the protest movements’ many hypocrisies and flat-out fabrications. Although the numbers are preliminary, enrollment officials said, based on these early numbers, they expect decreased attendance for the 2016 – 2017 school year.